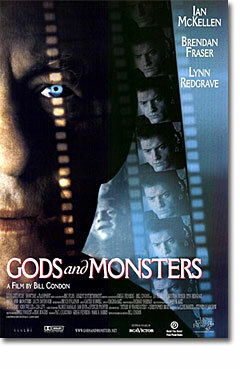 There are whiffs of Sunset Boulevard in Gods and Monsters but the movie, to its credit, is completely original. An old Hollywood recluse (with a German housekeeper) is attracted to a handsome stud and someone winds up face down in the backyard pool. That's pretty much the plot. This time around, though, the recluse is male and not as bonkers as Norma Desmond. He runs from his past rather than surrounding himself with it, and his relationship with the young stud is tentative and complex rather than smothering and creepy. Overall, Gods and Monsters is less likely to give you the shivers than Sunset Boulevard and more likely to infuse you with a sense of sadness and longing. Viewing, one inevitably conjures up the lost faces and missed turns in one's own life. Literature has always been better than film at probing into the minds and memories of its characters, but Gods and Monsters does a pretty good job of picking up the slack. Ian McKellen plays James Whale, the director of such '30s classics as Frankenstein, The Bride of Frankenstein and the Paul Robeson version of Showboat. He's turned his back on Hollywood but recently suffered a stroke. As his mind and body betray him, the past catches up. Memories flood back unbidden. We tend not to get entire scenes  as in most cinematic flashbacks  but bits and pieces. A more honest depiction of memory which still manages to convey the story: early life in poverty in England; his father worried and disgusted about his Nancy boy son; love and death in the trenches of World War I. About his father, James Whale is past the point of judgment. "It's as if farmers were given a giraffe," he says plaintively about being taken out of school at 14 to work in the factories. "They don't know what to do with the poor creature but hook him up to the plow." Whale tells his exquisite stories while his gardener, a Frankenstein-like Clay Boone (Brendan Fraser), whom Whale re-names Clayton, sits for a portrait. At first we expect Clay to be another seduction  we've seen Whale at work before on boys  but the gardner is all innocence and sudden anger, and he doesn't care for that kind of crap. Yet the tension between the two is palpable. We think we know what Whale wants from Clay, but what does Clay want from Whale? A sense of class? A sense of having made it? Clay seems as huge and unpredictable as Whale's monster. The first time we meet him he almost grunts out his name, but it's not overdone, he's simply swallowing in the midst of much yardwork. Fraser is perfect for the role: strong jaw, flat-top head, threatening yet childlike manner. His acting is eons beyond what one expects, and one wonders why he makes the movies he does. Because he can? Because it pays well? Because he's too heavy a physical presence for better films? Here, he holds his own with McKellen and Redgrave, which says a lot. McKellen is delicious: the wide, tantalizing smile of a jackal masking decades of hurt and impending death. Redgrave shuffles through the movie with a perpetual disapproving frown, muttering under her breath about her employer's sexual predilections. The script is sharp, and there is as much a love of stories here as in Smoke, which is odd, because writer/director Bill Condon's only other theatrical release is Candyman: Farewell to the Flesh. Where came this talent? Wherever it came from, I hope it comes back.